GMD Webinars take a Spring Break! This is a great opportunity to catch up on past webinars: Click here for the archives or get the webinars in podcast form! We will be back next week when Gerald Aungst will present on activating curiosity and creativity in our Math classrooms. Register now! You: I teach/do/work in proximity to math. Stranger: Oh, I hated math. In these scenarios, we’re being positioned into the role of advocates and, sometimes, the role of apologists. What kind of response is being expected, after all? The same happens with Pi Day. We are asked, usually implicitly, to align ourselves with the holiday, actively rally against it, or ignore it entirely. In each case, we act as advocates for some position. But using the term advocate in relation to mathematics is tricky. An advocate is usually someone who promotes or defends a group of people or a cause that has been marginalized or excluded. In this sense, “advocate for mathematics” becomes an oxymoron. Mathematics is not marginalized; it marginalizes. In conjunction with STEM, mathematics is a prism through which dominant ideologies express themselves – and not as themselves, but rather as the refracted images of seemingly more neutral concepts such as objectivity, rationality, and truth. 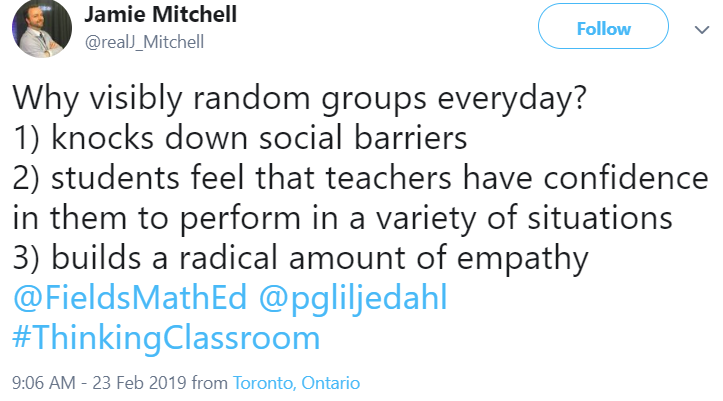 So rather than seeing math teachers as “advocates for mathematics”, it makes more sense to see them as “advocates for people doing mathematics”. Preoccupations with the digits of Pi is not just a disservice to mathematics but more importantly a disservice to the people who do mathematics. The mysticism often associated with Pi should be combated because math is not mystical and because elitism should be removed from the culture of mathematics. Melvin has pictured above what we may call the “Orlin Interpertation” of Pi Day. Call it a “W” for mathematics, and embrace it! All mathematics teachers need not hew to the Orlin Interpretation, as Melvin nicely points out above. Many of the activities are superficial, and we should take care to not make them too non-mathematical (or all about edible pies). 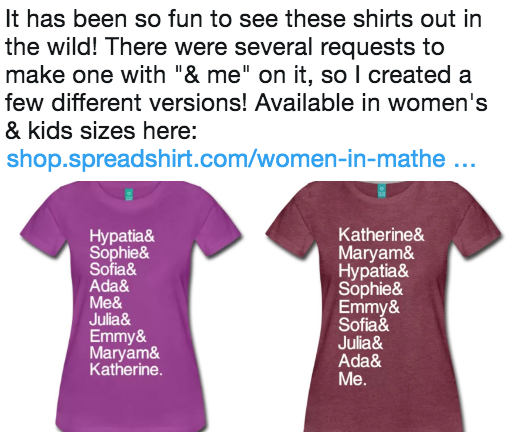 But taking the “W” here could mean letting Pi Day be a part of the culture, because how many mathematical things are truly embedded or woven into the culture? 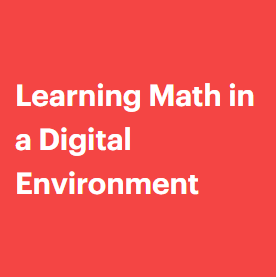 Awareness is good, but building on this math win hopefully means pushing other mathematical ideas and concepts further into the public sphere. i Day? Sure, “imagine” that? Tau Day? Have at it. Getting beyond just cutesy interpretations of date notation (e.g., 3/14) would be good as well. K-12 teachers of mathematics are in a good position to push mathematics further into the culture than ever before! Mattie B bravely acknowledges the tragedy in New Zealand with his students. He clearly states that students should avoid watching the video or reading the manifesto as it should be starved of attention; only to quickly learn that some students had already seen it. Teaching is political – I give credit to Mattie for attempting to talk about “the heavy stuff” even if imperfect (and without the structures), these are the moments that students will remember, this leadership, this willingness to engage with students as humans grappling with the world around. Why did you choose this book/these books? How does it/do they push you outside your comfort zone? What is so different about it/them? The perspective? The setting? The plot? Mirror: To what extent do you see yourself reflected in the book(s)? Window: What are you learning about this different perspective? Wonder: What did you wonder or think about as you were reading your book(s)? Tricia Ebarvia submitted this comic from incidental comics to help visualize the power books can have for our students; perhaps providing our students with powerful questions and diverse books will help facilitate “the heavy stuff” that Mattie B is willing to discuss. Sharing with students what we are reading like Christie Nold does on her classroom door can inspire our students to see their math teachers are whole people, with interests outside of our math curriculum – with the hope that our students may also be inspired to pick up a book and expand their own world view. I am wondering if Ms. Nold’s door sign could be expanded to somehow imitate the bookstores we grew up with (the kind with handwritten notes of recommendation under the book titles). I imagine a book wall (or a wiki) where students can recommend books they are reading to each other. Do you use groupwork in your classroom? Do you ever wonder if it looks anything like groupwork in other teachers’ classrooms? In our research we get to see a lot of different teachers do groupwork, and we’ve noticed that teachers circulate and interact with groups in a rich variety of ways. From what we’ve seen we don’t believe there are “best monitoring practices” that always work for all teachers, but we’re curious how understanding the variety can help teachers better understand their own context and goals around groupwork. For example, do you approach a group only when they ask for help? Or do you systematically check on each group? The two graphs below describe two classrooms during groupwork activity. The horizontal axis represents time and the vertical axis represents the group the teachers visit (group number -1 indicates the teacher was monitoring the whole classroom instead of visiting a certain group). Each colored rectangle represents an interaction of the teacher with a group. Green rectangles signal teacher-initiated interactions, while blue rectangles signal student-initiated ones. What do you notice about the graphs? What situations might the left graph be more appropriate for, and what situations might call for something more like the right graph? 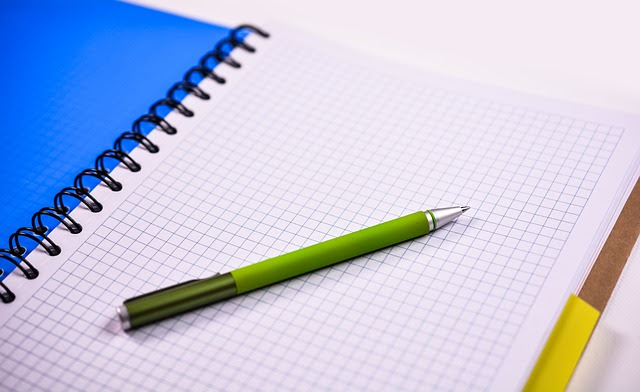 What would a graph from your last groupwork lesson look like? How do teachers approach groups and initiate conversations? What do they first say to the group as they enter the conversation? What is the focus of the teacher’s interaction with the group? Participation norms? Math? Which type of math? How do they exit the conversation? Are the conversations open-ended or close-ended? Do all students in the group participate in the conversation, or just some of them? If you’re interested in more, read a summary on our project website or see more classroom graphs here. 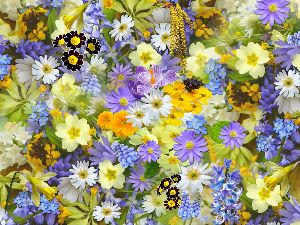 As this is a work in progress we would love to know what you think. Critique is also welcome, so feel free to let us know what you think is missing. Tweet us with your ideas! Written by Nadav Ehrenfeld (@EhrenfeldNadav), Grace Chen (@graceachen) and Ilana Horn (@ilana_horn). Several school systems are gearing up for Spring Break 2019, but if you are still in school this week you might be gearing up for #PiDay2019. I was reminded of Pi Day 2019 coming on March 14 when I saw a tweet from @MathIsVisual with this great visual of a “Would You Rather?” and a blog post called “Understanding Area of a Circle Conceptually” with visual prompts that will help students generate the formula for finding area of a circle. If you want more ideas or videos, @CarneigeLearn also tweeted this link with a few more resources and a fun video. 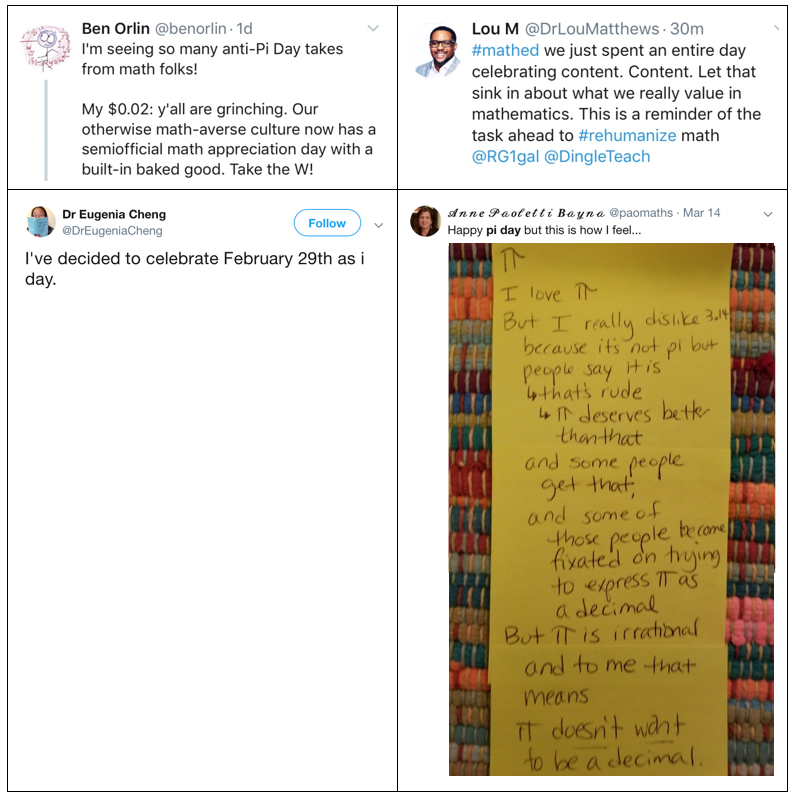 I would also suggest checking out the hashtags #PiDay and #PiDay2019 for even more great ideas. 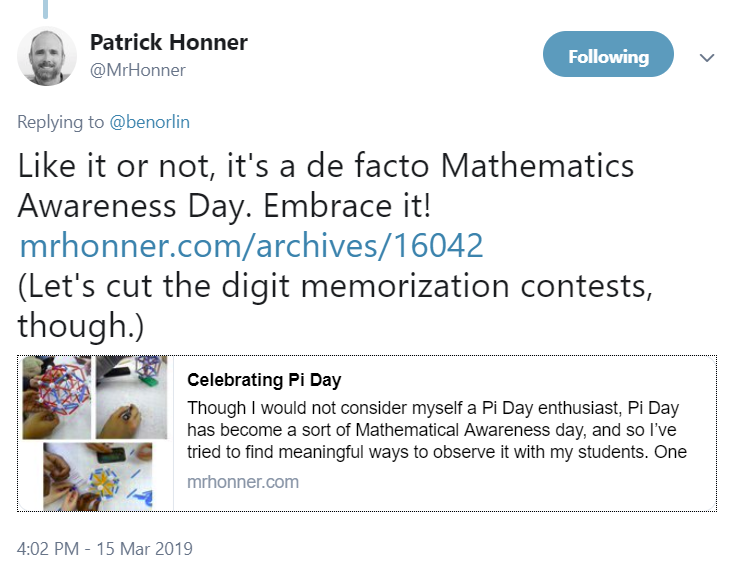 Help build a great search by adding those hashtags to your Pi Day tweets for other #MTBoS-ers to find! Last week Amanda McGarry presented the webinar, ” Foster Student Engagement and Exploration with Interactive Simulations.” If you missed it, make sure to catch the recording!Don’t forget – recordings for all previously held webinars can be found here. John Rowe has recently release a free eBook titled, Hook Line Sinker. Line – Activities to build on students existing knowledge. Sinker – Activities to help consolidate learning and make connections to other topics. Amie Albrecht suggested on Twitter that the Hook-Line-Sinker categories map nicely onto the first three levels of Depth of Knowledge with Recall and Reproduction (DOK1), Skills and Concepts (DOK2) and Strategic Thinking (DOK3). The book also contains some links to some great online resources and problem banks. The vocabulary I heard was impressive! 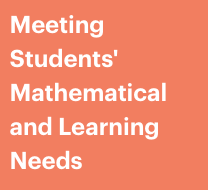 I have found that using a “Stand & Talk” before a Desmos Activity can be highly effective! During the share-out phase, students not only CORRECTLY matched the graphs, but ALSO entertained the idea of what the graphs might mean if the descriptions beside each graph DID represent the graph. Follow the rabbit hole, people. Go! February has been difficult, for a number of reasons, in a number of ways. The stress of our profession is a real one, and mathematics is no exception. Tweets about leaving teaching, searching for meaning, and avoiding burnout are not uncommon. Some are brave enough to blog about it as Lybrya Kebreab has done. She was courageous enough to pursue her passion, share her learning with us through her blog, and also share her uncertainty as she navigates her current transition. However, what is admirable to me is that while in her transition, she is still pushing herself to learn how to teach mathematics well. It is her passion. It is her life. 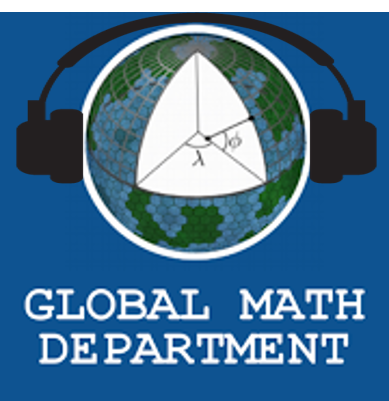 In her latest piece, Lybrya discusses teaching a lesson on functions as delineated in Making Sense of Mathematics Teaching: High School, from #DNAMath. Students are to decide which population has the greatest growth from four functions, which she brilliantly turned into a WODB activity that allowed students to display their wealth of knowledge. After the first class period of the two-period lesson, she challenged them to reflect on their learning, and charted the results. Lybrya closes her blog humbly, asking readers for feedback on her lesson. 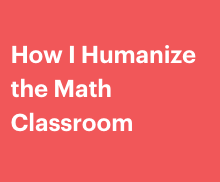 She is someone who truly humanizes her lessons, attending to students’ identities and agency. Her blog is highly recommended.